If you live in Colorado and haven’t caught the flu yet, you should probably buy a few lottery tickets. I cringe every time I hear a little sniffle at the grocery store – I know it’s the sound of the flu virus getting closer and closer to making my family its next victim! If you take a look at the CDC weekly US influenza surveillance report, you’ll see that the flu season isn’t new, and it’s probably not going away any time soon. Colorado has been reporting extremely high influenza and influenza-like activity since early November. Having a sick kiddo is the worst feeling, especially when you can’t avoid exposure at school, work, running errands, or even from other family members!! At Partners In Pediatrics, we understand the importance of protecting your child’s health, especially during flu season. Our integrative pediatric clinic believes in the power of supporting a healthy immune system to assist in preventing the flu and other colds. Echinacea can be used to support the immune system in helping to resolve a viral infection. For dosing, follow the package labeling accurately. ReBoost Immune and ReBoost Decongestant is a homeopathic herbal remedy by MediNatura that can provide significant relief for cold and flu symptoms and boosts your immune system. It can be used by children or adults. Horehound can be very effective in reducing mucus production and improving a wet cough. It may help in the recuperative phase of bronchitis, if there is a significant amount of mucus production. Be sure to follow the packaging’s dosing instructions carefully! Valerian root is a mild herbal sedative that may offer some help in easing a child with significant restlessness. Valerian root may be most useful at bedtime. As above, watch for the packaging’s dosing instructions! Herbal teas may offer some delicious, soothing relief of cold symptoms (especially a sore throat) and also provide a good source of fluids. 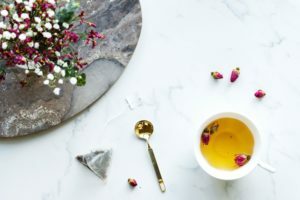 Herb teas made from chamomile or mint as well as a variety of blended herbal teas can be brewed according to package directions, sweetened to taste, and offered frequently throughout the day. Herbal teas are one of the tried and true methods for boosting your child’s immune system. And the old standbys still apply: drink tons of fluids, wash your hands regularly and get plenty of rest! And Partners In Pediatrics reminds you that flu shots are still available and we do recommend them. Having a sick kiddo is no fun for anybody, but there are ways to help make the situation less unpleasant. If you have any questions or your child needs some care, get in touch with us to ensure your little one gets the best integrative pediatric care in Metro Denver. Stay healthy – and stay tuned for part 2 of our flu remedies series!